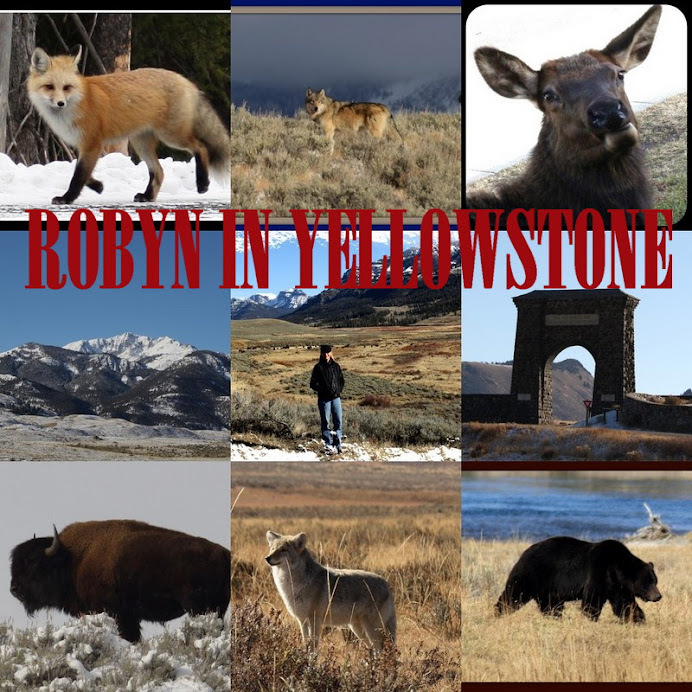 Where has Robyn in Yellowstone been lately? Well, in the technological black hole that is Yellowstone at times. The issue started about 2 months ago when my last phone died and I bought a new one. Verizon is the only carrier that works decently in Canyon but for some reason my phone could only pick up bars after 10:00pm. With phone communication lacking it became a real issue about 2 weeks ago when I started getting reports of both of my parents being ill back in Minnesota. My father has 2 ambulance trips to the hospital and my mom was being brought into the ER by cars. My father eventually ended up in the ICU for a week. In order to get updates on their conditions I would have to take time off work and either drive 35 miles to Mammoth or go up and over Dunraven to find a signal. Sometimes I made the trips without ever reaching anyone so I would have to a second drive in the evening in hopes of getting a hold of someone with info. What about e-mail, you ask? I had issues there, too. My computer quit hooking up about 3 weeks ago and the manager's computer at the store was taken off line when their was technological problems with the routers. So even in a pinch I couldn't access my e-mail account on the store computer. In the end everything turned out well. My father was released from the hospital and my mom started feeling better. They had consumed something contaminated which started this whole downward spiral. I'm glad your feeling better, mom and dad!! And with a trip into a Verizon store it turns out that my phone is defective. I should be getting a new one next week. In other news.........it snowed a couple weeks ago. A fresh blanket of fluffy whiteness covered the ground over the mountains and up the road from Canyon. I'm not totally surprised by this because of the cooler temps we had been experiencing. Now it has warmed up (to a balmy 60+ degrees) during the day but the evenings are still chilly. The southern part of the Park had a covering of smoke earlier this week when strong winds blew in the smoke from a fire near Idaho Falls. The windows in our rooms had to be closed that night because the acrid smoke stung the eyes and throat. Luckily it was for only one night but it brought back memories of the Arnica Fire last fall and how Canyon filled with stinky smoke. It has also been a sad week in the Park. Their were fatalities two days straight: a motorcycle accident north of Norris and a drowning in the Yellowstone River. As much fun as it may seem to toodle around Yellowstone on a motorcycle it is extremely dangerous. There are numerous buses and large RV's as well as animals and cars stopped in the middle of the road around sharp curves. Just a reminder to all who crave the wind in their hair atop a motorcycle in Yellowstone: be extra cautious and defensive! The Park should be filling with motorcycles as Sturgis approaches and I want all of them to live another day to come back and experience the Park. I've been in numerous jams lately. There have been a few bear jams (by Steamboat Point and north of Obsidian Cliff) as well as a coyote jam east of Fishing Bridge. The mama grizzly and her two cubs have been making a regular appearance over Dunraven (once with an exasperated ranger when people were getting too close). Once last week rangers had to haze a bear away from Canyon Junction. The Dorm Bison, Bob, The Magnificent One and the Boys of Summer are all still around wowing everyone who goes by. The Adventure Store is also involved in a few fun bonding activities. We just finished our employee photo contest (Matt: Overall Photo & Animal; Morgan: Scenic; Dave: Human and Humor) and everyone is working on their 2 week Scavenger Hunt which involves them to take a picture of their mascot (a 12 inch plush animal) at different areas of the Park or with various items. The one with the most points wins. It is requiring everyone to get out into the Park and use maps to locate areas they were not familiar with. It turns out that the Adventure Store employees are one competative group. There is nothing like watching Jack, a 21 year Marine vetran, scour the Park taking pictures of his plush bison at the entrance stations and with rangers. Dave and Morgan are taking quite a bit of time hiking to various locations to snap a photo of their mascot at the top of mountains (such as at the top of Mt. Washburn). So if someone in the Park stops you and asks if you would pose with their stuffed animal it is probably just an Adventure Store employee trying to win themselves a fly fishing pole. And a close encounter for Jay and Cassie. While hiking a young male grizzly bear came crashing through the woods and stopped on the trail ahead of them (which inclined upwards so it was looking down at them) and stared at them. They backed away and the bear left them alone. But it was a knee-shaking encounter that they hope to never have repeated. I'm glad it ended well for them! I am also gearing up for the Pig Races in Red Lodge in a couple of weeks. Patrick and I will be taking them in along with a few other YGS employees. This is a yearly activity and we have been included in the festivities this year. 3 condos have been rented and there will be lots of great food and fun as we bet on the fastest pig running around tracks. I should also send out thank you's to everyone who has stopped into the store to say "hi!" these past couple of weeks. It has been upwards of 7 groups. I love to meet everyone face-to-face and hear about their adventures in the Park. As for all those unaswered e-mails I have - I hope to get to those soon but at this moment I am going to close and go sit out on the porch of Patrick's cabin and look across the Wapiti Valley at Jim Mountain.